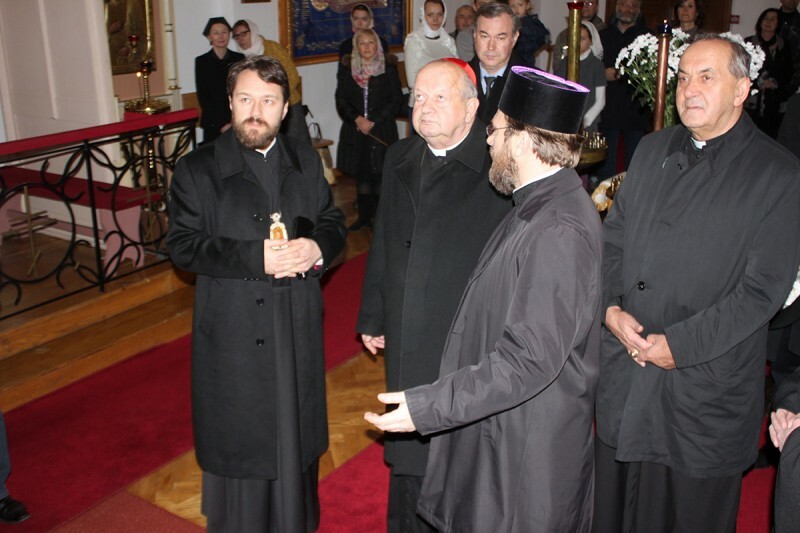 December 1, 2013 – Metropolitan Hilarion of Volokolamsk, chairman of the Moscow Patriarchate’s department for external church relations, during his working trip to Poland, visited Krakow. The welcoming party at the airport included Cardinal Stanislaw Dziwisz, Archbishop of Krakow, a group of clergy of the Polish Orthodox church, and Russian Consul General in Krakow V. Kolesnikov. From the airport Metropolitan Hilarion went to the Polish Orthodox Church’s Parish of the Dormition to meet with parishioners and to see their parish life. After that, accompanied by Cardinal Dziwisz and other officials, he visited the Church of the Assumption, the Royal Palace and the Cathedral of Ss Stanislaw and Waclaw on Wawel Hill. In the evening, there was a press conference in the archdiocese building, after which a solemn dinner was given in honour of Metropolitan Hilarion. The sides discussed some questions of the past and present state of Orthodox-Catholic relations. It was noted that cooperation in education and students exchange between theological schools was one of the promising areas in the development of relations between the Russian Orthodox Church and the Roman Catholic Church in Poland. After the meeting, which was held in a warm atmosphere, the sides exchanged tokens of the meeting. The DECR chairman is accompanied on his trip by Archpriest Dmitry Sizonenko, DECR secretary for inter-Christian relations, and A. Yershov, aide to the DECR chairman.